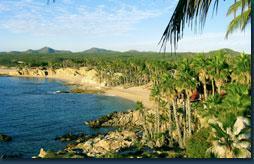 Chileno Bay promises to be the premier masterplanned private golf, beach and marina community in Los Cabos. Although primarily a private resort community, Chileno Bay will have a balanced mix of private and public uses, including a lively marina and marina village inspired by Portofino, Italy. These two elements will combine to make Chileno Bay one of the most desired luxury destinations in all of Mexico. 1260 acres with coastal and beach frontage as well as stunning dramatic desert mountain settings. 725 residential units, including custom homes and homesites, townhomes, villas and condominiums. Intergenerational, family oriented membership structure. Two 18-hole Tom Fazio, championship-caliber golf courses. Luxurious private beach club and spa. A world-class marina featuring 63 slips at over 100' ft. in length designed by Moffit. A beautiful, pedestrian-friendly setting reminiscent of an Italian seaside village.